In this video we will discuss models in an mvc application. Let's understand models with an example. We want to retrieve an employee information from tblEmployee table and display it as shown below. Copy and paste the following code in Employee.cs class file. We want to use "Employee" model class in EmployeeController. So copy and paste the following "using" statement in "EmployeeController.cs"
By default an Index() Action method is created in EmployeeController. Change the name of the function to Details(). 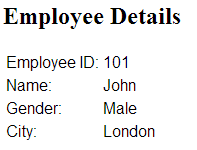 Create an instance of Employee class. For now we will hard code Employee data in this class. In a later video session, we will discuss about retrieving employee information from the database table tblEmployee. At this point EmployeeController should look as shown below. d)From the "Model class" dropdownlist, select "Employee (MVCDemo.Models)"
Note: If Employee class is not visible in the dropdownlist, please build your project and then try adding the view again. At this point, Details.cshtml should be added to "Employee" folder. Please note that "Employee" folder is automatically created and added to "Views" folder. Copy and paste the following code in Details.cshtml file. At this point if you run the project, and if you navigate to the following URL, you get a runtime error stating - Object reference not set to an instance of an object. To fix this error, pass "Employee" object to the view. The "return" statement in Details() action method need to be modified as shown below. That's it. Run the application and navigate to http://localhost/MVCDemo/Employee/Details. We should get the output as expected. Great videos! I'm receiving an error when trying to view data from my database though that says a primary key has not been defined. However, I do have my Category_ID column set as a primary key in the database. How do I handle this exception. I'm very new to MVC and coding in general so any help is much appreciated! same problem with me, i think that problem is in Entity, i need solution for this! Is your database local or in the SQL Server provider? Viewbags/Viewdata should not be used. Bad practice. Stay inside MVC and use the MODEL. if you will use view bags or view data . there is higher probability getting error. it is advisable to use Model structure. I Am getting tgis error The parameters dictionary contains a null entry for parameter 'id' of non-nullable type 'System.Int32' for method 'System.Web.Mvc.ActionResult Details(Int32)' in 'MVCModel.Controllers.EmployeeController'. An optional parameter must be a reference type, a nullable type, or be declared as an optional parameter.